A hilly backyard can enhance your landscape and give your home a picturesque view. How to Prepare Your Lawn, such a home can be the epitome of luxury. But mowing such lawn can prove challenging. Riding or rolling lawn mowers designed for steep hills can be expensive. Mowing on such slopes can also prove dangerous because of obstacles you will meet. The lawn mower for hills should be able to address these problems. Forget about the expensive, specialized lawn mowers designed for steep hills. All you need to do is to pay attention to your search to find a regular lawn mower that you can still use for hills. Thankfully, we have prepared a helpful resource to limit the time you will need to make the decision. Following are our well-thought recommendations for the best lawn mower for hills. Later on, we will provide you with a helpful guide on what to look for in a good lawn mower for hills. 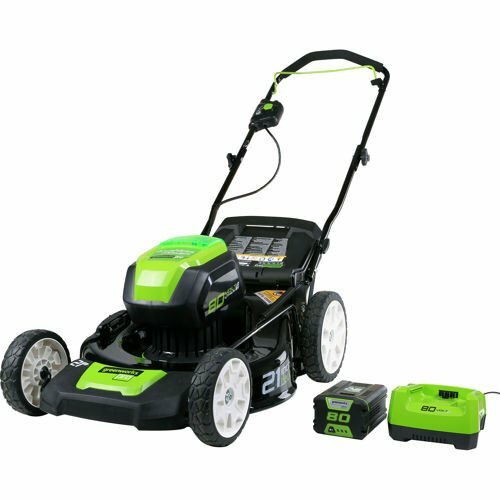 The EGO Power+ Lawn Mower is genuinely the best lawn mower for your hilly backyard. It equipped with technologically advanced features and specifications. It thus features a performance equivalent to the high-end brands but remains affordable. The mower is cordless. It draws its power from an advanced arc Li-Ion battery 4.0 Ah 56V that comes with a compatible charger. The battery is powerful. It provides you with 45 minutes cut time. Such power offers you the performance of gas-powered mowers with less smoke, fuss or noise. You don’t have to worry about downtime's due to charging. Incredibly, the included charger only takes 30-minutes to charge the battery to capacity. The mower can achieve 20-inch cut capacity. EGO Power+ will deliver you the best performance in any weather condition. Because of its weather-resistant construction. When you need to tuck it away, the mower features a folding design. It folds fast and easy for sturdy, upright storage. I love the fact that I can fold the mower and store it in my garage. When it comes to functionality, this machine has fantastic features. First, you will like the LED head lights that allow the user to use the mower at any time of the day. If you are a busy fellow like me, you will also love the machine. In case your daytime schedule is tight then you have the night to treat your lawn. Since it produces 30 percent less noise, you won't have to disturb your neighbors' peace. The Troy-Bilt TB330 163cc is a premium quality lawn mower that can be perfect for yards on hilly slopes. The mower is self-propelled. The mower’s engine transfers some of its rotating shaft power to the rear wheels as it operates. This eliminates most of the effort you need to push the machine making your work less strenuous. The machine gets its power from 4-cycle Briggs & Stratton 163cc OHV 725EXi engine. The engine is efficient and will provide you with years of reliable performance. This walk-behind mower has sufficient power to mow half-acre yard without an issue. Although the engine does not offer electric starting, it features Ready Start starting system. This pull-cord start system allows users to start the engine with minimal effort. The TB330 provides you with variable speed control. Thus you can adjust the speed of the mower depending on the condition of your yard. In the end, the feature contributes to better results. You can also customize the cutting height via a convenient lever. There are six cutting heights to choose from ranging from 1.25 inches to 3.75 inches. The design features a deck wash. The technology aims to minimize the hassles associated with regular cleaning and maintenance. If you want to enjoy the convenience of a cordless lawn mower then you can check out the Greenworks PRO. The machine gets its power from technologically advanced electric motors. The DigiPro brushless motor is reliable and efficient. It will provide you with a performance equal to that of gas-powered models. The motor gets its power from 4AH or 5AH lithium-ion battery. Such battery will provide up to 60 minutes of cut power. However, you will need to buy the battery and charger separately. 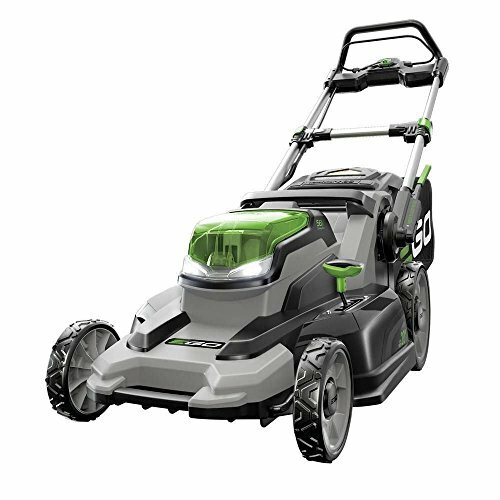 The mower features Greenworks so-called smart-cut technology. The technology aims at improving the performance of mower and its run-time. It will allow you to complete your mowing task fast and with ease. Another aspect of performance is the 3-in-1 functionality of the 21-inch steel deck. You have the options to side discharge, mulch or rear bag for grass clippings. The machine operates up to 30 percent quiet compared to gas models. Unlike the gas-powered models, the Greenworks Pro produces minimal vibration. It means you can mow for as long as the battery allows you without exhaustion. As with most cordless tools, this lawn mower for hill needs no maintenance. You are also free from the inconvenience of cables with a tendency to tangle. Unlock the power of a gas-powered mower for hills in the Honda HRX217K5VKA. Although a gas-powered mower, the model is among the quietest. It features Honda's patented Versamow System. The unique system allows four-in-one performance. The 21-inch deck can afford you mulch, bag, side discharge or shred grass chippings options. Even more interesting is the fact that the system allows the combination of functions. You can mulch and bag at the same time by sliding a convenient clip director knob. You can then choose how much grass to mulch and how much to bag. All this you will do without tools or expensive attachments. The machine features twin blade MicroCut System. The technology uses 4-cutting surfaces resulting in thin clippings for perfect mulching. It also results in extra chippings per bag. It deck features NeXite, an extremely strong and compact material. The material does not dent, corrode or rust with time. It will add to the durability of the mower. The mower features GCV190 engine. 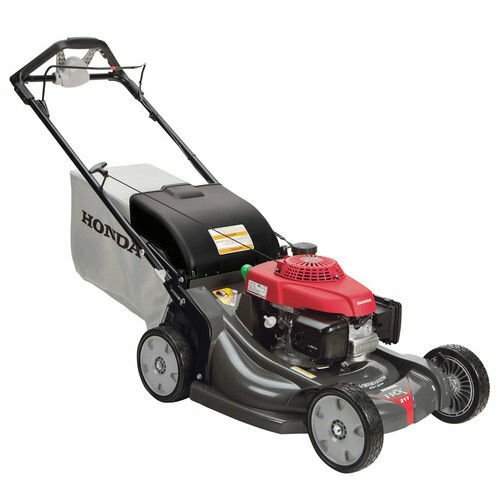 Users of Honda products know that GCV190 engines start quickly, are fuel efficient and are powerful. It will give you years of reliable performance. Besides, you can easily adjust the speed of the mower to your stride. You can then engage the Select Drive control for impressive, comfortable speed management. 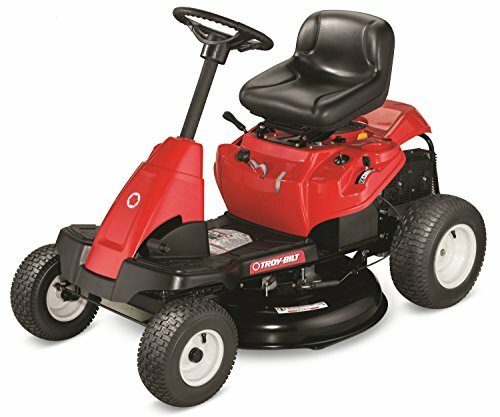 Do you prefer riding lawn mower for hill and you can part with a slightly higher cost? If so, a good choice would be the Premium Neighborhood Riding Lawn Mower from Troy-Bilt. The mower boasts of a massive 382cc Auto Choke OHV engine giving in the biggest power of all models in our review. You know that such performance comes at a cost. The machine equipped a fuel tank that has a capacity of 1.3 gallons. The tanks have a window through which you can check the fuel level. You will easily know when to refill your mower. With a massive 30-inch cutting deck, you can be sure to finish your task fast. You can choose from five mowing height options. This feature will give professional mowing results. The mower can achieve a maximum forward speed of 4.25 mph. But you can adjust the performance speed of the mower via six-speed transmissions. The adjustable speed option is necessary because hills need low mowing speeds. The large size of the deck makes it wise to ride carefully on slopes. Wowing on a hilly slope can be dangerous. The first step to achieving a successful mow is to choose the right mower for the purpose. A wrong mower may not cut anything or at best deliver poor quality mow. 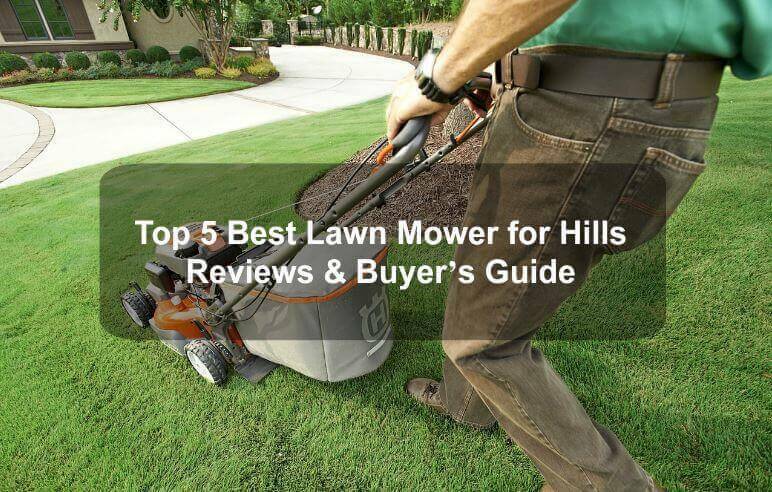 To help you succeed, here is our resourceful buying guide on what to consider before buying a mower for hills. When it comes to the best mower for hills, the drive mode you choose is of utmost importance. In this case, you can choose from a rear-wheel drive, front-wheel drive, and all-wheel drive. The best choice of mowing on hills is a rear-wheel drive. An all-wheel-drive may also be good in a lot of situations but may not be great for hilly yards. Rear-wheel drive has excellent traction. This becomes important especially if you were to lose control of the mower. You can choose between 3 different types of mowers. These include walk-behind lawn mowers, zero-turn lawn mowers and riding lawn mowers. The walk-behind models are the best for hills. This is because they allow you to rapidly position your mass as you move along the hilly slopes. Besides, they are easy to control through press buttons located on the right side of the mower. Zero-turn and riding lawn mowers can tipple easily. Deck size determines the time you will take to complete your mowing task. For large open yards, the best deck size should range between 42 and 54-inches cutting width. However, narrow lawns and those in sloppy areas will need shorter decks. It will give you better control as you will easily move the mower around obstacles. A light lawn mower is ideal for hilly yards. A heavier one will be difficult to the handle especially when you need to move it up and down the hills. However, you have to balance power with weight. Its because most lightweight models do not have enough power necessary for efficient mow. In other words, the mower should be powerful yet light enough for easy handling on slopes. Many models of lawn mowers allow for various accessories to improve functionality. Nevertheless, such attachments add to the overall weight of the mower. It would be wise to avoid unnecessary attachments of your mower cannot accommodate them. It will reduce the weight you can bear and thus make your mower easy to control. Some lawn mowers are complicated and thus hard to control. It may become problematic for new users. If you are new to this machinery, it would be wise to choose a model that is easy to operate. Most of the ones we have included in our top 5 lawn mower for hills reviews are very easy to operate. Look for one with easy operation features. Examples of such features include cruise control. The feature allows the mower to navigate around a given area without cumbersome instructions. Make your hilly backyard picturesque by mowing frequently. It’s important that you use the right mower. The most mowers are ideal for mowing flat, open yards. Certain salient features make certain mowers more suitable than others in mowing hills. Our top choice has a majority of these features. The others in the list of top 5 best lawn mower for hills are also great.